Voting for the Arts and Science Federation of Associations begins Tuesday and ends Thursday. ASFA represents about 20,000 students within Concordia’s Arts and Science faculty. 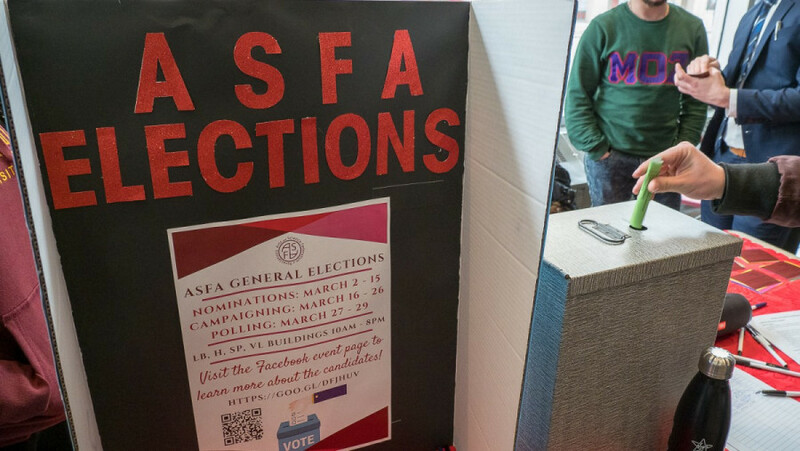 This year, ASFA is attempting to increase their fee levy, and change their by-laws. Quorum for the election is 370. ASFA is looking to get a $0.14 increase to their fee levy, which hasn’t increased since 2008. Despite representing the largest number of students after the Concordia Student Union, ASFA has the lowest fee levy of all the faculty departments. If the referendum question passes, the extra money will go to increasing the budgets for their member association and their executive honorariums. An ASFA executive makes an average $2,500 in honorariums at the end of their mandate. Current president Jonathan Roy said this creates problems for students, since they often need to work a part time job to be financially sustainable while working as an executive. Valente added that this year the member associations’ received an 11 per cent increase in their budgets compared to last year, and the last thing he wants to do is lower their budgets for next year. This is the seventh time ASFA has asked for a fee levy increase since 2015. The Concordia University Centre for Creative Reuse is a workshop where students and the Montreal community can work with used materials to create art and build projects. Using waste from around the school and Montreal community, students are invited to use their space and tools to repurpose waste into art and other items. This question would give the group a fee-levy from Arts and Science students. In order to build an extension to CUCCR, called CUCCR 2.0, the group has requested funds from several groups across campus, previously getting funds from the CSU. “The connotation right now is that this has to do a lot with Fine Arts students […] but really any student and anyone really can just build themselves a desk or can paint some art work or anything so it’s applicable to the artistic and handiness of all of our students,” said ASFA President Jonathan Roy. Brought forward at a recent council meeting by Women’s Studies Councillor Jane Lefebvre-Prevost, this referendum question is aimed at standing in solidarity with Indigenous communities. If this question passes, the above lines will be ingrained in the association’s bylaws, and aim to ensure the association wouldn’t take actions that oppose Indigenous sovereignty. In this question, Indigenous sovereignty is defined by the recommendations of groups such as Concordia’s Indigenous Directions Leadership Group. The group was created to implement the recommendations of the Truth and Reconciliation Commission at the university, and will be releasing their own recommendations when their mandate ends this summer. “It’s really important to acknowledge these issues and present some sort of substantial stance on this. We can’t just have these very metaphorical approaches to decolonization without having a physical contribution of some sort, and even if our physical contribution is just action through non-action,” said Lefebvre-Prevost. Roy also said that ASFA wanted to have the advocacy and executive coordinator instead of a general coordinator, because they want ASFA to strive for advocacy, since he says it’s what they care about the most. The other changes ASFA wants to make to their the by-laws can be read here.